Anchorage Memories VIP is your fun, nostalgic monthly magazine featuring memories of Anchorage, stories, Alaska trivia and much more - delivered by email. You are our VIP - a Very Special Person - yes you! And when you join Anchorage Memories VIP, we want to bring you a VIP experience. Including fun Anchorage and Alaska stories, lots of memories to enjoy, Alaska trivia that will make you say, "I didn't know that" and all the special nostalgic photos we can show you. You'll receive this free, instant downloadable story about when Mike of Anchorage Memories and his brother Tom went camping on a small island in Alaska when they were teenagers. And how their overactive imaginations made them pack up and run for home. 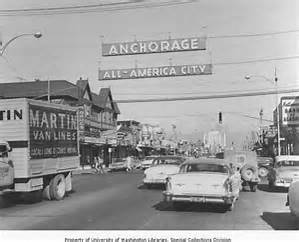 On the first Sunday of every month, you'll enjoy fun Anchorage and Alaska stories, and pictures of Anchorage days gone by. You'll learn more about Alaska when you read "Alaska Nugget" short facts about the Great Land and you'll hear from our VIP members when they write in to Anchorage Memories VIP. you'll enjoy fun looks at Anchorage and Alaska like these. We only ask you for the information we need to send you our Anchorage Memories VIP magazine. Your first name and email address. It's also protected by European Data Protection Law. Your fun, once-a-month VIP magazine takes a nostalgic look at Anchorage and vicinity from years gone by. What movie theater was your favorite? The 4th Avenue Theater? Which Anchorage radio personalities did you enjoy listening to? Do you know your Alaska trivia? Did you ever drive that long and narrow road known as the Alaska Highway, or the "Alcan"? What were your favorite restaurants? The Lucky Wishbone? The Arctic Roadrunner? Where did you go to grade school, junior high, or high school? Yes, you'll probably be looking for your next edition, just to see what great memories you'll enjoy. Our readers tell us, "I haven't thought of that in years", and "Thank you for the wonderful memories". Yes, your once-a-month, free VIP magazine is a fun way to enjoy Anchorage and Alaska stories, Alaska trivia, Memories of Old Anchorage, comments from our VIP members and much more. Plus, you'll receive your free book "Adventure on Wendigo Island" just for joining.